This month I got a new camera :) The Bushnell Trophy Cam. I tested it out in my garden on the first day I got it. The quality looks decent and the IR flash will be interesting to play around with. It is also a lot smaller than my other camera and has better battery usage. I now have two cameras so I hope to get more exciting pictures. 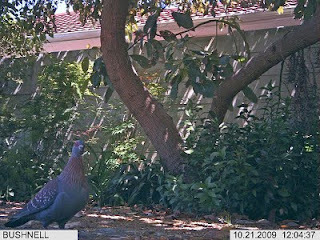 Speckled Pigeon (Kransduif) checking out the new camera. 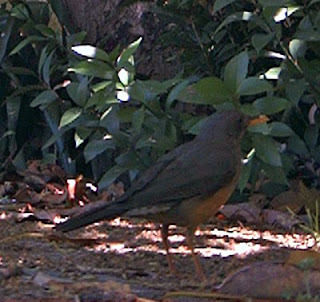 Another one of the locals, an Olive Thrush (Olyflyster). The day after getting the new camera you could find me crawling around on the slopes around Kirstenbosch looking for a spot to place the camera at. I'll be checking the pictures this week. I hope that the camera was in a good spot! Lately I have been getting a few pictures of animals that are just not clear enough to be 100% sure what species it is... Pictures like that always torment me and keeps me wondering what I could have done differently to get a better picture and whether I can do anything to not make the same mistake again. The truth of the matter is, naturally, that we are dealing nature. These are wild animals and their behaviour is largely outside of my control. I prefer not to use sent or bait, but sometimes it is useful to do so. I also depend on a cameras that tries to sense body heat and then has to wake up (trigger time) before it can take the picture. It also has to wait (recovery time) before it can take the next picture. These are just some of the factors that influences being able to identify the animal or not. Below are some examples of pictures that are a little more difficult to identify. Some of the animals are easier than others to take a guess at. 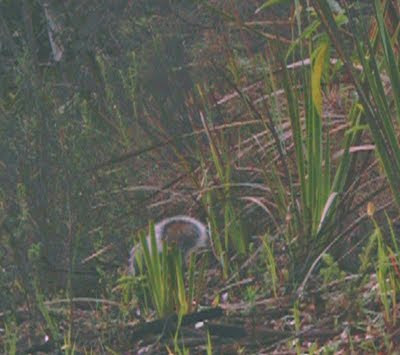 This is probably a Grey Squirrel. But what is this? A bird, yes, but what species? This in fact is a porcupine. I know this because luckily another picture was taken as it got further away from the camera. During September I got some interesting pictures of Large-spotted genets. Here is one of them showing the genet close to the camera. I have learned to put some pieces of plastic bag over the flash to prevent it from over exposing animals close by and it seems to be working well. The highlight was the Caracal! Usually I prefer setting the camera to Picture mode, but I was playing around with Video mode when the Caracal passed. The Caracal is currently the largest predator on Table Mountain and it is great to see that they are still around and doing well. Lets start with a brief background. Almost two years ago my wife bought me a Moultrie D40 for Christmas. I was very happy with this great new toy. (Unfortunately for her she has since learned to dread that fateful day...) The past year I have been trying to find evidence of mammalian life on Table Mountain. This has proven surprisingly difficult. It turns out that fynbos is a little less large mammal friendly than other ecosystems, so I have my work cut out for me. Recently I have focused my attention on the Kirstenbosch area, since it is conveniently close to my office. At first I tried week after week with no success. Finally I got some pictures and since then I've been improving (albeit slowly but surely). 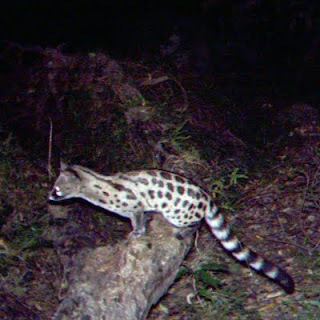 Large-spotted Genets are common in certain areas around Kirstenbosch. These handsome small carnivores seem to prefer the more foresty parts. 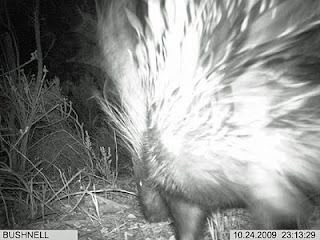 After months trying to find a single picture of a Porcupine I now seem to find them almost everywhere!